Our 2018 bear season started in the beginning of May, with a late winter and 3 feet of snow in the trees it made the hunting very slow. In the first 5 days of the season we only had spotted a sow with 3 cubs. Jacob took his hounds and tried to strike one but movement was minimal. Then on May 5 after a few days of warm weather the story changed 110%, the bears started moving, it was like a light switch. 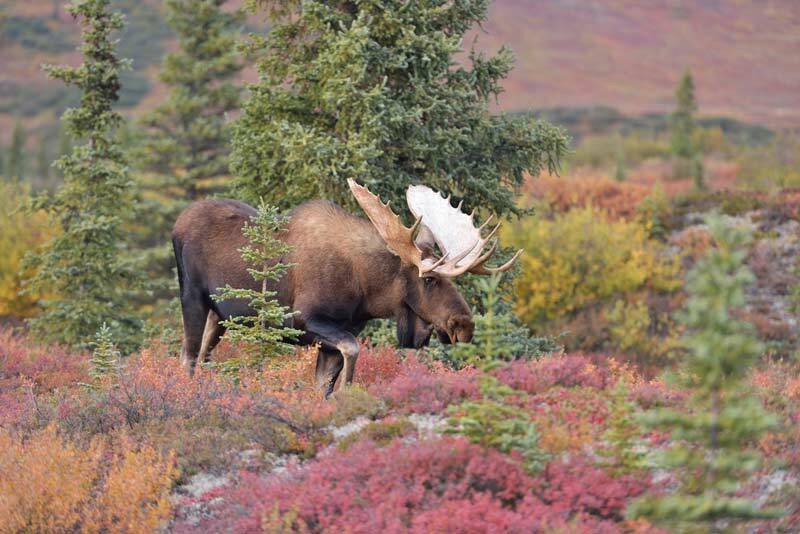 Jacob took our repeat client out Armando Sr who has successfully hunted Elk and Moose with us years prior. On the first day of the hunt Jacob was able to spot a mature boar a mile away, without being sure of the trophy quality of the bear Jacob and Armando made the stalk. 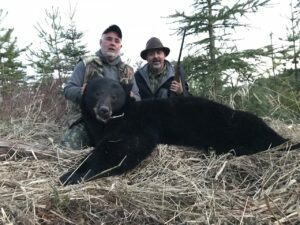 When they got within 500 yards of the last spot they spotted the boar they couldn’t locate the bear again. They kept glassing for another 45 minutes hoping the bear would graze again. 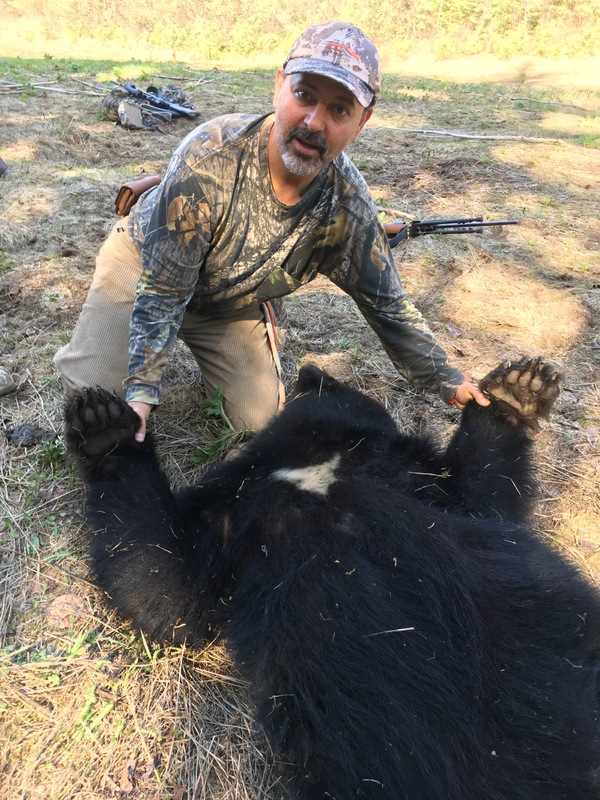 Half hour before sunset Fernando (Armando’s Brother) spotted the bear walking 450 yards away on an open hillside. This is when Jake informed Armando this was a very big bear, most likely book. Jacob told Armando that we should stalk above on a road to get a better closer shot but Armando told Jacob he was comfortable making the shot. 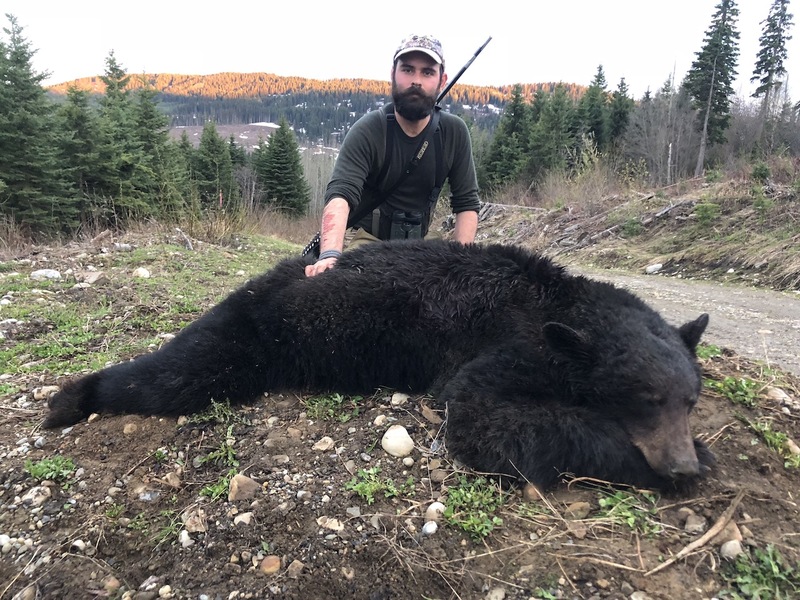 He got set up on an old stump and waited for the bear to turn broadside, gently pulling the trigger he made a perfect shot right behind the front shoulder, double lung shot. He reloaded but it wasn’t needed as the bear piled up behind a small tree 30 feet way. 15 minutes passed and Armando was able to put his hands on a true trophy of a lifetime. 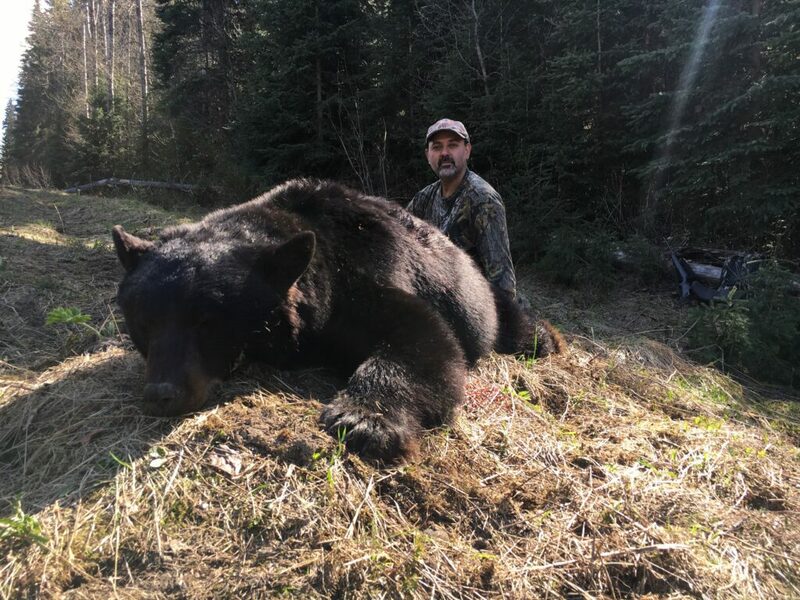 The bear measured seven foot two with a good sized head. We would like to congratulate Armando on his trophy and thank him for his continued business. We will see you next winter for your Mountain Lion Hunt. It was Fernando’s turn now, Armando and Ignacio’s brother. Guide Jacob Blair took him to a secluded part of the pipeline on day 5 of the hunt. The previous days they seen 10 bears but nothing what Jacob called a “shooter”. The walked into a spot we call “boardwalk”, a half hour walk from the main road. Jacob has had great success in this spot taking 4 bears in two seasons from here. They glassed into the pipeline, nothing…but something didn’t seem right, and after another look Jake confirmed it was a bear sleeping on the side of the pipeline. It was 435 yards away but no way of getting closer without spooking the bear. They waited another 15 minutes then the bear started grazing, confirming it was a shooter. Fernando got into prone position and put the bullet right where it needed to be. 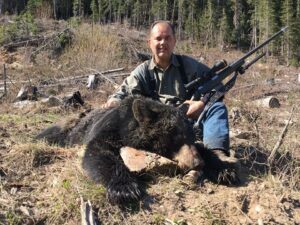 The 300 win mag spun that bear around, a quick ethical kill. The bear squared just under 7 feet and had a white crescent on his chest. Good Shooting Fernando!! Fernando will be coming hunting cats with Jacob during the 2020 season. Thanks for your continued loyalty! Out of the 4 Mexican Clients that came only one needed a bear now, Armando JR. Armando has killed an elk, moose and bear before with us. But never killed a mature boar in the spring time. On the second last day of the hunt, after passing up multiple smaller bears. Jake spotted a very big bear in the cut block 500 yards away, Armando and Jake tried to close the distance but was unsuccessful. Continuing to glass in that cut block there was a boar and sow grizzly above them 600 yards. 1000 yards away on the far hillside of the cut block a black bear covering ground going towards the grizzlies. Jake led Armando within 60 yards of the bear and set up the shooting sticks, one shot and the bear piled up 15 yards away from the road. Once recovering the bear we looked back and realized the grizzlies never spooked after the shot and actually start walking towards us. Taking some quick pictures we loaded the bear on top of the dog box and got out of there. Being rushed we forgot the shooting sticks on the road. 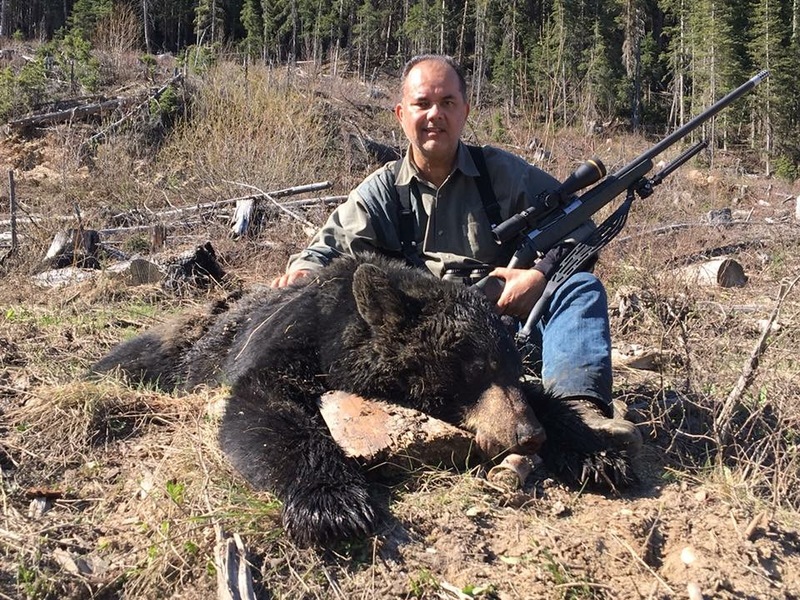 Thankfully there is hardly no hunting pressure for bears in the guide territory and we grabbed them the next day.